When I scroll through Facebook from Thanksgiving through the new year, I often see pictures of families gathered around the table playing games. I know that at our house, we play a ton of games as we munch popcorn and enjoy each other’s company. There something about seeing multiple generations unplugged from electronics and playing games the old fashioned way! Having raised two children and now as a grandmother to three, I’ve got a few games you may not have heard of that I’d like to recommend. Yes, they are educational games but sshhhh…don’t tell the kids. They’ll never know! These games come highly recommended from education experts, they help build reading and math skills, and they are a ton of fun! All three games are around $12. “24” Math Games: These innovative math games are designed to improve basic math skills. There are editions for ages 7 on up to 12. This game provides fabulous math facts practice! It’s so simple: just make the number 24 from the four numbers on the card. You can add or subtract or multiply or divide using all four numbers on the card—but use each number only once! Each game contains 3 challenge levels, 48 cards. We mainly played the multiply/divide primer edition, geared toward eight and up (third through fifth grade). 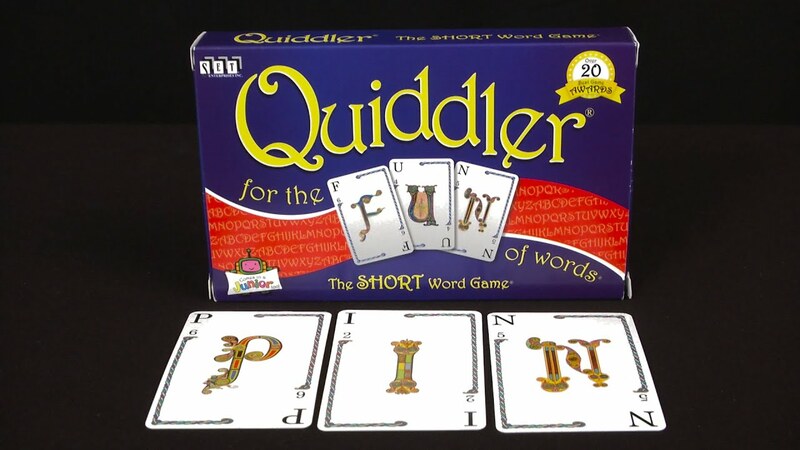 Quiddler: We play this game the most…you can do it with two people, or on up to 10+! It is our family’s favorite word game. It is a fast paced game of words, where you arrange your hand of cards into words by taking turns and discarding. Letters are worth various points and you get bonus points for the longest word and the most words. A great game to play around the table after a holiday feast! For ages 8+ (Younger children can be a “team” with you if they are just learning to read!). Set: Described as “the family game of visual perception”, this game really keeps grandma on her toes…but kids are amazing at it! It tests your skills of memory and observation. Using unique cards with varied attributes, players must identify different kinds of 3-card sets. “Set” boasts 20 “best game” awards. Age 8+. These games are all available on Amazon; you may also be able to find Quiddler at Target or Barnes and Noble. Do you have a game recommendation? Please leave it in the comments section! Next up: Book recommendations for children!